Byte Brothers tools exhibit 3 qualities: Innovation, Top Quality, and Affordability. Byte Brothers guarantees these 3 qualities plus offers US-based customer support, training and quick upgrade and warranty service. Whether you are in the dotcom, telecom, audio/video, electrical or security field, you will find Byte Brothers products designed for you at a price you can afford. The CTX590 Proton Wire is a must-have tool for those working in a Telco or network cabled environment who needs a classic, telephone-type tester to trace and locate cable ends. 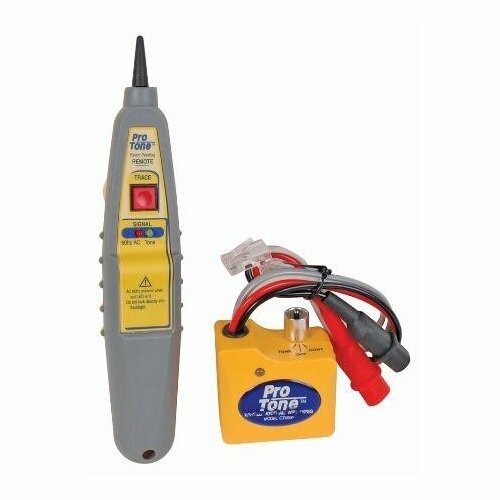 The same probe technology sold with 1000s of Triplett's Real World Certifiers has been expanded and coupled with a powerful, compact "classic" tone generator to create the Proton Wire Locator Kit. Locate cable runs by placing a tone on one end of the cable with the tone generator and detecting the tone on the far side with the tone probe. Connections can be made to RJ11 and RJ45 jacks and to any wire pair using alligator clips. Test for continuity (shorts) and the presence of voltage (AC, DC and polarity are indicated). Circuitry allows connection to live circuits without damage. Switch selectable tone (steady or warbling). Large Red/Green LED for indicating shorts, continuity and voltage polarity. The Tone Probe detects tone from the tone generator and features an ultra bright LED lighted tip to see in dark closets. The safety LED indicates "60HZ present" and the "Tone present" LED lights to aid in noisy environments. Insulated tip stops accidental shorts when probing punch down blocks. Volume control. Includes: Pouch and 9V (2) batteries. Founded in 1904, U.S.-based Triplett Test Equipment continues to be on the leading edge of specialized testers. Whether supplying vital test equipment to the U.S. Signal Corps during WWII, or providing the railroad industry with essential testers to ensure the safety of their crews and the public, Triplett prides itself in developing innovative, reliable, and durable test equipment for every technician--that also won't break the bank.